Everyone knows the undoubted benefits of the system of exercises called yoga. And one more advantage is that with the help of yoga classes you can lose weight, return the body to its former harmony and flexibility. The use of yoga for weight loss has been known for a long time, and many people today use this method because its effect on the body is multi-purpose. The complex includes special exercises, which are called shatkarmy. They refer to the purification and allow the supply of the maximum amount of oxygen in the body. After learning to breathe properly in training, a person makes it a part of everyday life. During the yoga classes, all muscle groups are involved. For example, the gluteal muscles are made more resilient after a few months of training - and this is a group of muscles that is difficult enough to be affected. For each person, an individual set of exercises is usually developed, depending on the existing problems of the shape. As for weight, then, doing regularly the complex, you can lose weight. Although this effect can be expressed not so clearly, since simultaneously with the "withdrawal" of fat, muscle mass is formed. However, there is no need to worry about what the scales show because the changes that occur with the figure will be quite impressive. From problem areas fat is removed, muscles become embossed, joint mobility and flexibility are improved. At the same time, if you give up most of the strength exercises and increase the amount of stretching exercises, muscle mass growth can be slowed down. 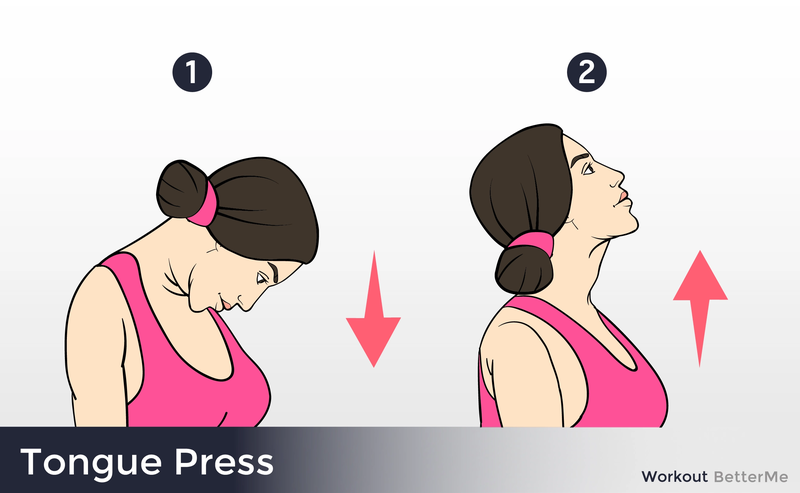 Today we want to show you a set of exercises that will help get rid of such an aesthetic problem as a double chin. Scroll down to find out the details. Sitting with your back straight and shoulders down, tilt your head back so that you are looking at the ceiling. Forcefully press your tongue flat to the roof of your mouth. 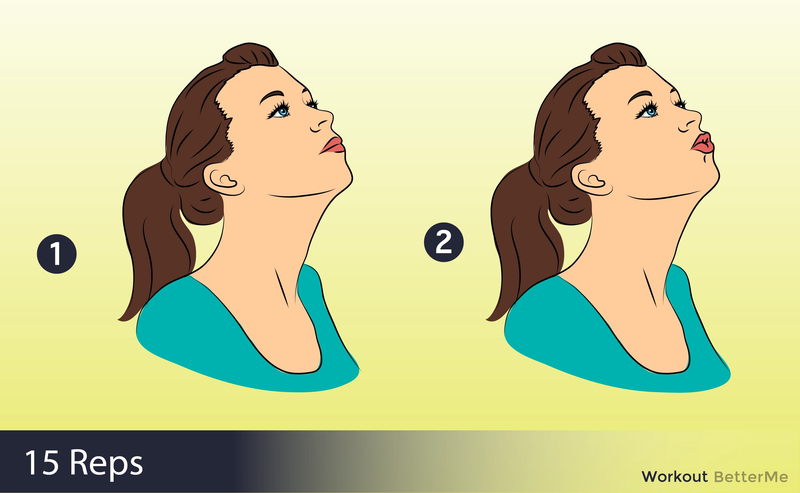 Then, keeping your tongue against the roof of your mouth, lower your chin to your chest as far as possible without rounding your upper back. You should feel your chin and the front of your neck contract. 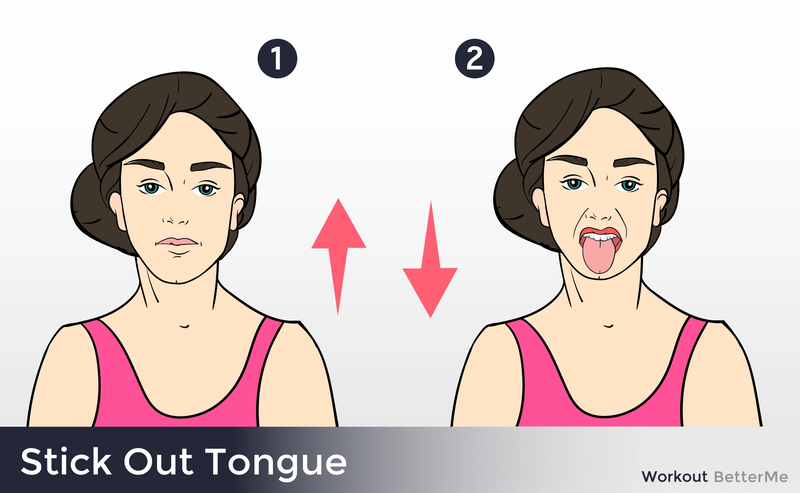 Then relax your tongue and straighten your neck to return to the starting position. That’s one rep. Complete two sets of 20 reps each. In a seated or standing position, elongate your spine for a tall, straight back. Then, leading with your chin, slowly and gently rotate your head so it moves in a full circle from your shoulder to chest to shoulder to back. 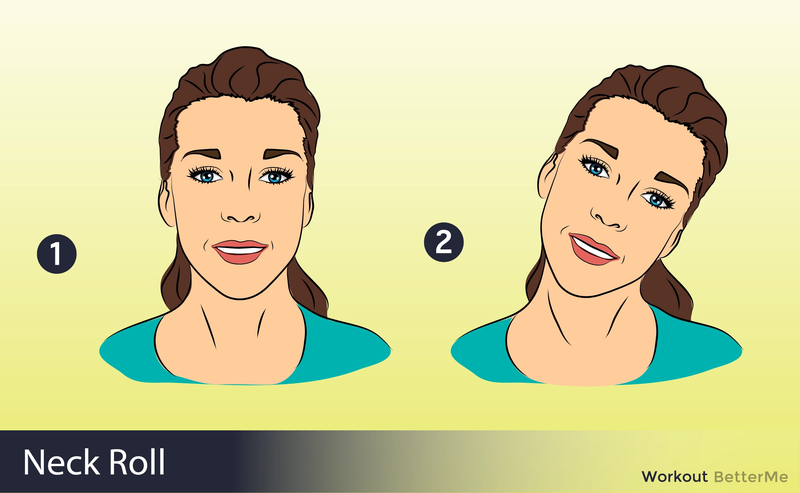 (If full circular rotations bother your neck, stick with semicircles moving from shoulder to shoulder.) Make sure to keep your shoulders down and back throughout the movement. That’s one rep. Complete 10. Repeat in the opposite direction. In a seated or standing position, elongate your spine for a tall, straight back. Moving your jaws up and down like you are chewing and keeping your lips together, inhale deeply through your nose then slowly exhale while humming. When you finish the exhale, open your mouth as wide as possible with the tip of your tongue gently pressed against the back of your bottom teeth. Holding this position, inhale then exhale with an audible “ahhh” sound. The entire move should take 90 seconds. That’s one rep. Complete two. Place your thumb on one side of your jaw, underneath your jawbone and just before it turns upward toward the ear. Place the same hand’s index finger in the same location on the opposite jaw. While holding your hand still, push forward against your hand with your neck and head. Hold this position for 30 seconds, then release your hand and move your neck back to the starting position. That’s one rep. Complete three. 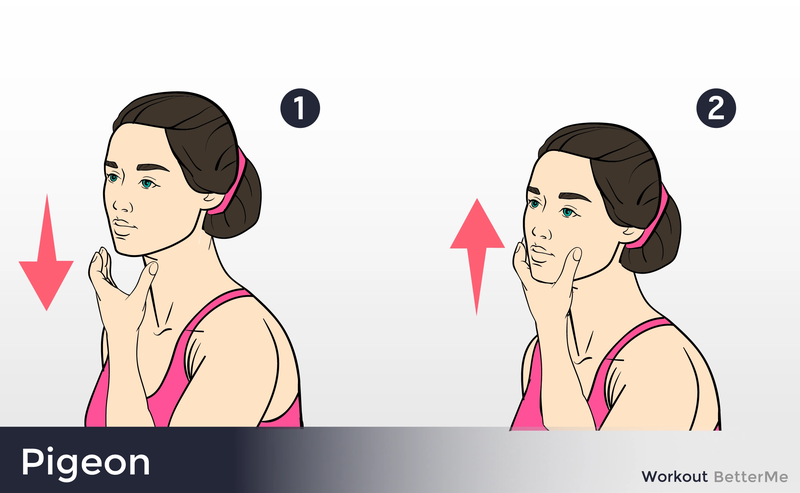 This is a great exercise that builds the muscles in your chin and can reduce a double chin without surgery. Stand or sit in a relaxed position. 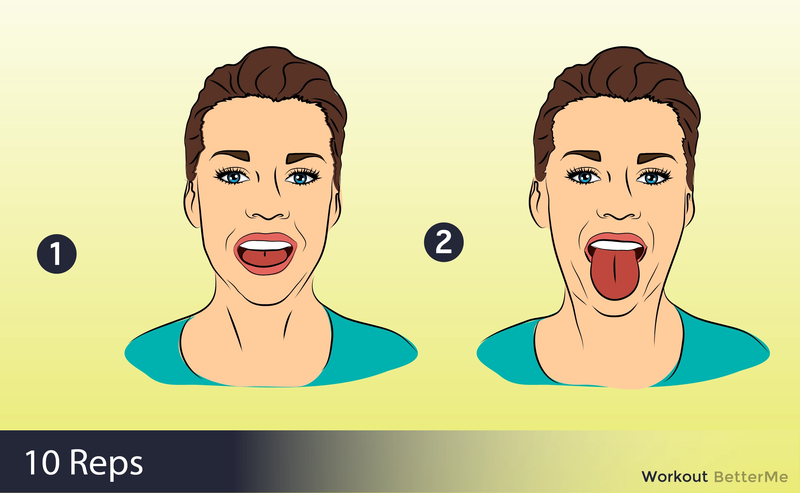 Open your mouth as wide as you can and stick your tongue out as far as you can so that you feel your chin and neck tighten. Hold your tongue out and count to 10. Relax and return to the starting position. That’s one rep. Complete 10.